Scout Sunday is an annual event among all faiths which recognize the good work that is done by Scouts in our religious communities. 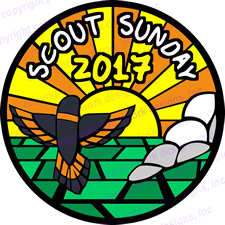 This year, Scout Sunday will be observed on February 5, 2017. The observance of Scout Sunday tradition was started years ago to make people in the church aware of Scouting, and to allow Scouts to live out of what is pledged each week. The Scout Law says that a “Scout is Reverent” and the Scouts of all ages promise to do their “Duty to God”. These values strengthen youth character in their family, community and faith. The EOCS Executive Board encourages all Orthodox Churches to recognize and celebrate this Scout Sunday even if their church does not sponsor a Scout unit. Anyone interested in their good work can go to the EOCS website at www.eocs.org to learn more about Scouting and the Orthodox Church. This year will be the National Boy Scout Jamboree at the Summit Bechtel Reserve in West Virginia from July 23. Once again the EOCS will be sponsoring an Orthodox booth, holding services and meetings with Orthodox Scouts from around the country and around the world. I would encourage all Orthodox Scouts to attend and be involved at the Jamboree.